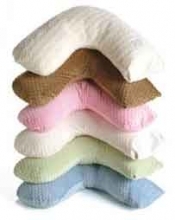 Minky Dots Nursing Pillow Discounts Apply ! The Bosom Baby Minky Dot Nursing Pillow and its unique "L" shape design fits every waistline without the need for straps, buckles or velcro. Removable, washable and durable covers with a 'fold' over (instead of a zipper) design eliminates the problems of broken zippers and shrinking fabric.